Sadly so far we have been unable to identify Sarah Jefferies. It is noteworthy that Scribes Alcove website which records the parish records of St Mary’s Church in Thornbury shows that there was indeed a Doctor Harrison who was living in Thornbury at this time and that he and his wife Mary had a son who was born in 1805 and baptised in 1808. However the record describes him as John Elliott Harrison MD but it says that his son was Charles Elliott Harrison, which suggests that Charles was a family name. We do not know whether Charles Harrison MD was an error for John Harrison MD or whether there there were two men who were connected in some way. John Elliott Harrison a physician of Liverpool married a widow called Mary Mitchener on 12th May 1801 in Christ Church Liverpool. We do not know where the couple lived after this time or why they moved but it is noticeable that their son Charles Elliott Harrison was born in Milford Haven and baptised in the Calvanist Tabernacle in Wotton under Edge before his baptism in the parish church of St Mary in Thornbury. We do not know when John Elliott Harrison moved from Thornbury. In 1843 when the property was sold to William Cornock it was said to be in the occupation of Elizabeth Cox. The 1851 census shows that the property was occupied by a widow named Elizabeth Cox then aged 61 who was described as having a private income from owning a “house and money at interest.” She was living with her widowed sister Hannah Williams aged 73 who was “proprietor of land”. Elizabeth Chitts and her sister Hannah were daughters of William Chitts and his wife Christian nee Fowler. Elizabeth married Thomas Cox on 17th June 1807 in St Michael’s Church in Bristol. Her sister Hannah married James Weeks in Thornbury on 14th April 1801. Tragically, James died the following year aged only 23 and he was buried on 30th September 1802. On 27th March 1826 Hannah married again. Her husband was Isaac Williams from Cromhall. We are not sure what happened to Isaac. In 1841 Hannah was living at 7 Silver Street with Emma Chitts. In 1861 John Thomas and Susannah were living near to the Apple Tree Inn, Cockmead on Kington Lane, close to where the town cemetery is now located. 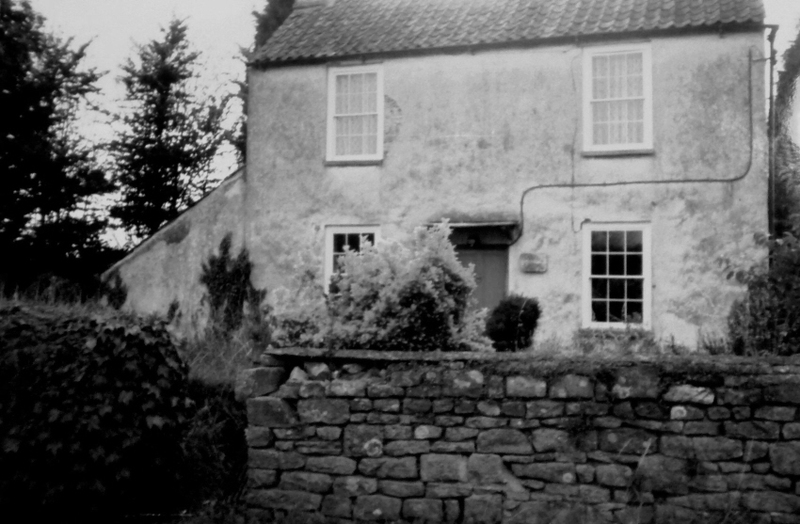 We suspect that they were living at the house now called Vine Cottage. The record shows that John Thomas was aged 27, was then working as a butler and was born in Thornbury. Susannah was aged 27 born in Stanford in Berkshire. At the time of that census they had two children, William John aged 3 and Ann Elizabeth aged 1. By 1874 when Susanna Jones became the owner of this property, the occupant was described as “Spencer”. The 1871 census shows that this was William Spencer a gardener then aged 49 and his wife Elizabeth from Newport in Devon. At that time they had two daughters living with them Emma aged 17, a dressmaker and Ellen aged 14 a pupil teacher. By 1882 the deeds show that the property was occupied by William Baker. The 1881 census shows us that the property was then occupied by William Baker a coachman aged 36 from South Cadbury in Somerset. His wife Emily was aged 40 and also from Somerset. At that time they had three children living with them;Frank aged 5, Arthur aged 7 and Amelia aged 9, all born in Somerset. William was born in 1843 and was the son of Samuel Baker and his wife Mary nee Clark. He married Emily Foot on 3rd May 1871 in Compton Pauncefoot in Somerset. By 1891 the family had returned to Somerset. William died in Bath in 1908. By 1892 the property was said to be occupied by Ann Honeyborne. The 1891 census shows that Ann lived at what was then described as “Cockmead”. She was a widow aged 62 and a retired greengrocer who had been born in Thornbury. Living with her was her son Edward aged 20 a plumber’s assistant. The name of Edward J Perkins appears in the Electoral Registers for this property in Kington Lane from at least 1896. Edward was born in Almondsbury on 4th August 1867. He was baptised in Almondsbury on 8th September that year and his birth was registered in the Thornbury District. His father was Daniel Perkins and his mother was Harriet. The 1871 census shows that Edward’s father was a gardener in Almondsbury and that Edward was the fourth child in the family. The 1881 census shows that the house was named Gardener’s Cottage and that it was near The Bowl in Almondsbury and the general shop. Edward’s father was a “domestic gardener” and Edward himself must have been working with his Dad as he was described as “gardener’s son”. Edward James Perkins married Emma Maria Helman in St Mary’s in Almondsbury on 2nd June 1894. In 1898 Amy Perkins who was born on 13th June 1895 began school at what is now St Mary’s Primary School. She was a bright girl as the record says she left in 1907 to go to the Thornbury Grammar School. Arthur Perkins who was born on 18th March 1897 began at St Mary’s school in 1900. He left the school in 1910 to go work. In 1901 the census shows that the property was occupied by Edward J Perkins then aged 33. He was a gardener from Almondsbury who had been married for six years to his wife Emma. They had a daughter Amy aged five years, a son Arthur aged four and a daughter Ida aged two. Ida Perkins who was born on 14th January 1899 began St Mary’s School in 1902. She left school in 1912 to go to work. The family still lived in Kington Lane in 1911. By that time they had three more children; a daughter Winifred aged nine, Joseph aged eight and May aged four. They also had a married couple visiting them , George and Minnie Denman both aged 26. Minnie was also from Almondsbury. The electoral registers show that the Perkins family stayed in the house until at least 1913. The family continued to live in Kington Lane. It was their address in 1915 when Winifred Perkins who was born on 10th July 1901 left St Mary’s school to go to work. The school record shows it was still their address in 1916 when Edward Perkins who was born 19th February 1903 left school to go work. St Mary’s school continues even to show Kington Lane as the address in 1920 when May Perkins who was born on 4th May 1906 left school to go to work. However we believe that by 1916 the family had moved to Morton as Edward James Prewett is shown at that address in the Prewetts directory and in subsequent electoral rolls. We know that of their sons Arthur at least served in the First World War as the local paper shows that he was included in the list of Christmas gifts sent in 1917 to the troops. At that time Arthur was serving in Winchester. Presumably this would be one reason why Edward James Perkins is one of those named as official collectors for the subscriptions for the War Memorial in Thornbury. Emma Maria Perkins died on March 14th 1940 aged 75 and was buried in Thornbury Cemetery. Edward James Perkins died April 5th 1946 aged 78 and was buried with his wife.